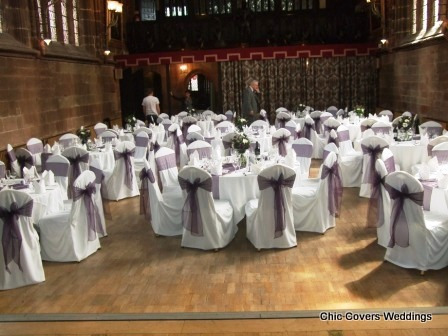 Chair Covers from £2.50 fitted, loose fit to cover venue chairs. We offer a choice of colours to choose from white, ivory and black freshly laundered and hand pressed and included with each is a tailored,fabric organza sash or our new range of hoods (supplement payable) again in a choice of colours to achieve a stunning result and transformation of the chair. We have different sizes of covers that are designed to fit a variety of chairs & they are all high quality loose fit covers. We are sorry but we do not use the lycra style covers. We will meet with your chosen venue if we have not dressed the venue before to make sure that they fit, we do not just use one cover design and hope for the best, others do!! We cover all the major Sutton Coldfield, Birmingham, Warwickshire and Staffordshire, Worcestershire venues and we will offer to beat any like for like quote that you may receive. Take a look at the "testimonials" were our past Brides & Grooms have left feedback on our services. We can assure that our range of premier venue dressing services will make a difference to your venue and you will not be disappointed with the result, pictures can be seen in the photo gallery. For more details and to enquire about your chosen date and to get a quote please contact us with the venue, date and numbers and we will get back to you promptly.